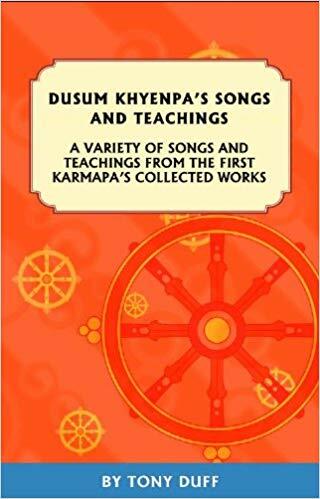 History of Dusum Khyenpa, his teachers and Kagyu Lineage. The story of being tested by Gampopa. 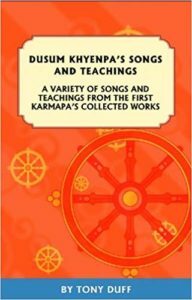 Clarification of ‘ Eight Lesser’ and ‘Four Greater’ Kagyu schools is a misinterpretation of ‘Older’ and ‘Younger’. During a full moon, to commemorate his teachers passing, he sang an offering to the three jewels. He had a vision dream of his teacher. We try to differentiate the mind which is manifesting constantly (consciousness, unconscious) and its essence. “Clear light” or “Luminosity” and experience its clarity. This experience cannot be conceptually confirmed nor negated, therefore it is free from extremes. It is Emptiness and Awareness together. This is the view. Analysis of Mind from the Vajrayana- Understanding the nature of mind. This is the View. Allowing your mind to be naturally in that state, to learn how to be actually how you are. View, Meditation and Action. This is result, Liberation and accomplishes your own purpose. There is nothing to gain or remove. Helping yourself and then helping other beings. The first of six paramitas, you can give and share without attachment. This includes attachment to the concept of being a giver or being the best or most generous. You can see who requires what to be the most helpful. Idleness can be translated as lack of concern. Diligence is joy, free from obstructions. These six qualities are to be generated not only in yourself for others but also in others. Dedicate this for other beings.